Bing rings in the changes but does anybody care? Bing rings in the changes but does anybody care? You Are Here:Home / News / Bing rings in the changes but does anybody care? Remember Bing – the other search engine? Well, Bing is working just as hard as Google and Facebook to improve its service and entice users. The problem for Bing is that it’s simply not considered as news worthy as the other two internet giants, so its updates fly beneath the radar. If you’re a regular Bing user (and you live in the US), you’ll probably have noticed the new features; if not, you’ll be pretty surprised when next you check it out (probably when Google is being a bit difficult). Adaptive search: this could go either way for Bing. Adaptive search takes personalised search to a new level. According to MediaPost’s Emil Panzarino, adaptive search takes previous search behaviour into account and then follows it up with actions taken as a result of the results. This makes it very, very subjective. It also runs the risk of being hopelessly out of date within a very short space of time. If you’re looking for vegan shoes and you eventually find and buy some, the next time you want to look up vegan recipes you could find some vegan shoes.Panzarino says that this makes Bing more of a push than a pull search engine. Effectively, they’re telling searchers what they should want instead of giving them options that relate to what they asked for. No doubt Bing will discover the pitfalls quickly enough and will make appropriate adjustments. The people who work there aren’t fools after all. Action buttons: are intended to pre-empt user needs and allow them to find what they want more quickly and search more efficiently. Marketing Pilgrim’s Frank Reed feels sorry for Bing because this cool feature has been largely ignored in all the Google/Facebook hooha. Basically, it relates to deep links, which Bing is making more obvious with large action buttons that will help you get where you want to go. So if you’ve searched for a restaurant, action buttons might include “menu”, “bookings” or “directions”. Bing Event: is intended to help you find and plan for upcoming events and activities. According to a Microsoft statement, Bing’s the first major search engine to offers such a comprehensive events feature. It’s not available worldwide yet. Bing Video homepage: this requires an HTML 5 enabled browser like IE 9. 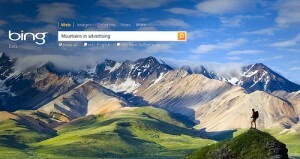 Instead of seeing the usual eye-catching photograph on Bing’s homepage, users get to see a video. It’s not going to be available every day, only when “the mood strikes” and it’s also only available in the US – for the time being. Bing Deals: is a deals aggregator rather than an actual Bing driven deal site. Not everyone is impressed. Marketing Pilgrim’s Cynthia Boris is less than happy with the feature, which she reckons is broken on several levels. But others think that it has the potential to simplify deal searches with filters for retailers, categories, location and keywords. Currently, it’s only available in the US. Voice-recognition search: this is reported to still be in the pipeline, with a possible release early in 2012. What do you think? Are you excited about Bing’s changes or are you too busy trying to keep up with Google?